Many people assume that when you need more hair coverage, your only option is to jump right to a full wig. The reality is that there are many nuances to this type of product. There are smaller versions designed to provide precise coverage that addresses specific concerns. This is where the top piece comes in. 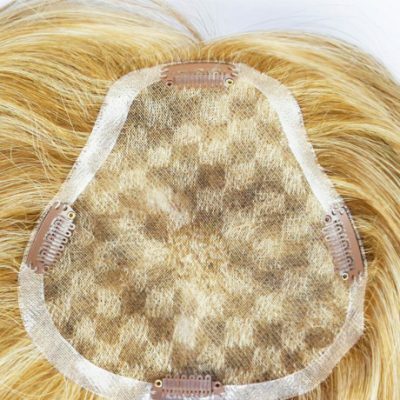 Sometimes referred to as a wiglet or hair topper, it provides an easy option that allows the wearer to take control of their look and the effects of hair loss. What Can a Top Piece Cover? A top piece can cover just about any area on or around your head. That’s why this is a better alternative for some women who have natural hair but want to cover specific areas. There is no set pattern, size, or shape when it comes to the thinning of a woman’s hair. That’s why each person needs a customized solution that fits her needs. You can have a top piece applied to areas that are highly visible, like the top of your head or your bangs. You can also use one to cover less visible areas along the sides or lower on the head. The versatility of the top piece is what makes it so appealing. They come in different sizes and lengths, so your stylist can personalize the fit. Is a Top Piece Right for Me? Front Hairline Coverage – A hair piece can be applied to deal with fringe and bangs. It can be shaped to frame your face and make your locks look fuller. This can also give you a way to experiment with bangs when you aren’t ready to trim your hair and commit. Partial Hair Coverage – Thinness or bald spots anywhere on the head can be concealed using this method. It’s a lightweight option that’s comfortable and can be styled to blend seamlessly with your natural strands. It gives your hair a full, consistent appearance. Full Top Hair Coverage – If you experience hair loss all along the top of your head, a top piece can help. They can be made in larger sizes to provide fuller coverage while looking natural next to the real hair underneath. Women who are not concerned about the cosmetic effects of hair loss or who only experience minor thinness may still consider a top piece. Our hair acts as a natural shield against the environment. The skin on the scalp is delicate and must maintain balanced pH levels to prevent bacteria and fungus buildup and to keep cuticles closed. If you have thin hair or a bald spot, this can cause changes in the scalp that can lead to an imbalance and other issues. It can also open the scalp up to getting sunburned. Sunburn can increase the risk of developing cancer and can cause premature aging or further hair loss. If you’re ready to take the next step, Tiffany Taylor can help. Get in touch today to discuss your top piece needs and receive a personalized recommendation from an expert. Take control of thinning hair and enjoy the freedom of a precise hair piece professionally styled to meet your needs.